It’s exciting — and definitely a bit nerve-wracking — when you decide to “go global” with an ecommerce business. No doubt there’s a solid business case backing the choice, or you wouldn’t have made it. One of several common scenarios probably led you to the decision. Exciting aspects of international expansion include the prospect of broader market exposure for your brand, and an expanded revenue base. But steady on… Take a deep breath and consider the intricate pieces of the international credit card processing puzzle. 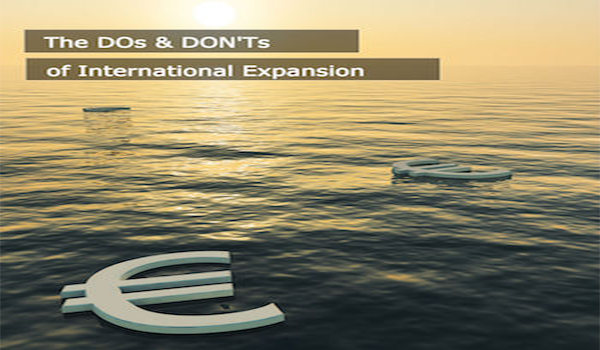 There’s a whole new list of things to consider when expanding internationally. Not only must merchants know the economic feasibility, but also the market trends, competition, consumer habits, cultural differences and common languages in target countries. International credit card processing also makes the list. Without payments from abroad coming in, the exciting dream fades rapidly. So put the champagne on ice, and focus on these do’s and don’ts that can save you time, money, and trouble. You probably already advertise — as available payment methods — all major card brands. Visa, Mastercard, American Express, Discover, and Diners Club are seen most frequently. When moving to international credit card processing, know that the buying habits and preferred card brands of prospective customers abroad may be different. Consider that the major U.S. card brands may not be accessible to or preferred by your prospective new customers overseas. Some may prefer to use PayPal or another digital wallet. Do research on their preferences, and make additions if needed. Also consider preferred currency, and provide a “payment language” for international credit card processing that your customers abroad will understand. One technological choice is to adjust your website’s checkout process to default to the correct currency based on the customer’s geographic location. Or provide a currency converter that displays details of total cost (including shipping and taxes). One example is WooCommerce’s Currency Module. Other options exist. Research all of your cross-border payments options for currency technologies, because it could impact your bottom line. Providing accurate details to your customers reduces the likelihood of confusion, which can lead to abandonment at checkout or chargebacks down the road. Give them a better experience, and it will cost you less as a merchant. Get comfortable with the local culture(s) of countries where you plan to implement international credit card processing. Being consumer-minded includes developing comfort with local languages, perhaps the most important aspect of different cultures. How can you do that as an ecommerce merchant? Ensure that your website allows users to select a language preference. Customers who can browse your site in their own language (or a language in which they’re strong) feel more comfortable and have a better experience. Customer service issues diminish too. As a merchant offering international credit card processing, you come off as more trustworthy and credible, and chargebacks diminish as well. No matter where you’re based, fewer chargebacks is better for your bottom line performance. Do not expect customers to navigate through a long checkout process. Keep international credit card processing simple and streamlined. One-click checkouts and other trimmed-down purchase options are what customers expect these days. Merchants need to accommodate those expectations. Make it fast and easy for customers to purchase what you’re selling. Decrease the number of website pages required to checkout. If it’s difficult or confusing, many would-be buyers simply abandon their carts and you sacrifice revenues. Don’t assume the same regulatory environment will greet you abroad. Each country has regulatory agencies that outline their specific requirements for conducting business. Be sure your business is setup to operate within the guidelines of local laws and regulations for each country where you plan to operate. Things to consider include: Restrictions imposed by import and export laws; impacts to your product and service offering created by local tax laws; the local dispute resolution processes and how they might impact your chargeback ratios. Remember too that the Payment Card Industry Data Security Standard (PCI DSS) is a worldwide standard. All merchants who process credit card payments anywhere in the world must comply. So don’t think you can slack off on compliance because international credit card processing boosts your business. Always confirm your payment processor is set up to meet compliance regulations and —now that you’ve expanded — to process international payments. You never know when your ecommerce business might become an international phenomenon. And if you’ve decided to go global by enabling international credit card processing, that day might come sooner than expected. So you owe it to yourself to work with someone who knows how the world of international credit card processing really works. Choose a processing partner who views you the same way, as more than just an account number. Choose someone with the knowledge, experience, relationships, and the reputation to help you achieve your dreams through international credit card processing.